Writing a biography of cancer — particularly one that clocks in at 600 pages spanning 4,000 years — was, as Siddhartha Mukherjee put it, “a little bit mad.” But Mukherjee went for it, writing The Emperor of All Maladies: A Biography of Cancer, honing in on the stories of patients – those who suffered primitive treatments, or survived thanks to radical advances. Today, he noted, cancer hits one in two American men and one in three American women. In addition to finding the patients who came before us, Mukherjee uncovered the broader social history of the disease – the way we spoke about it or didn’t, the way we fought it, and the way we coped. 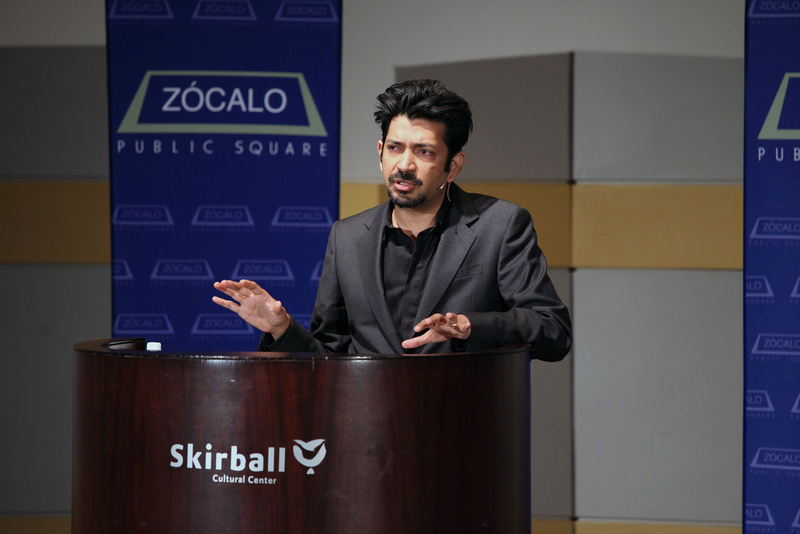 At a packed house at the Skirball Cultural Center, Mukherjee explained the importance of storytelling to medicine, why we should remember the patients who came before us, and asked whether we’ll ever beat cancer. The bridge between being a doctor and writing a book came to Mukherjee in the form of an analogy. If a book is an instrument to let a single writer communicate with a single reader, Mukherjee said, medicine is communication between a single doctor and a single patient. “Forget for a second the enormous paraphernalia of medicine,” he said. “In the end, medicine is an intensely emotional transaction.” Mukherjee described it as a narrative form, in which patients tell stories to doctors, and doctors digest and deconstruct and offer a new story to the patient. 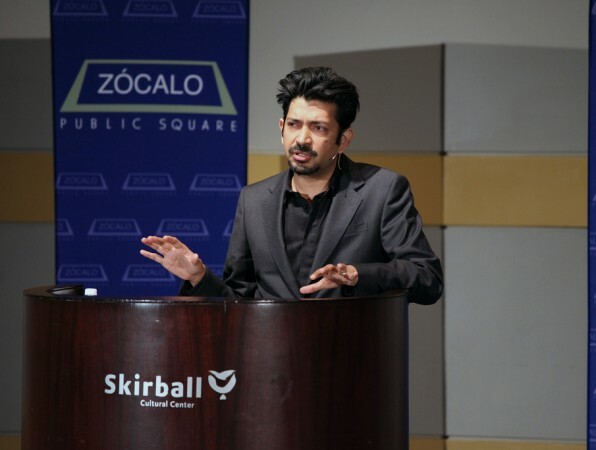 Mukherjee, who found the title of his book in an old text on cancer (“Cancer is the emperor of all maladies, the king of our terrors”), decided to consider his work a biography rather than a history for its exploration of the many faces of the disease. While he had trouble initially selling a long book on a grim topic, he said, the book’s focus on narrative makes it broadly appealing. Mukherjee dedicated his book to one of the patients whose story he unveiled. The story starts with the well-known history of oncologist Sidney Farber, who practiced pathology in a Boston basement the size of a generous closet. Farber, Mukherjee said, was driven by the desire “to stop just seeing patients after they had died.” He focused particularly on childhood acute lymphoblastic leukemia, which affects white blood cells. Farber found that by measuring these cells, he could see whether the cancer was in remission, making cancer into what Mukherjee called “an experimentally amenable disease” at a time when it was rarely discussed openly. With the help of his friend, Yellapragada Subbarao, another thwarted scientist dwelling in a nearby basement, Farber discovered that he could use antifolates to treat children with leukemia. Mukherjee called it a “watershed moment” that allowed Farber to start imagining a war on cancer. Mukherjee set out to discover who Farber’s first patient was, recorded in Farber’s papers only as RS. Mukherjee put out notices online and around Boston, but had no response for months. “Here I was, stuck on page 35,” he joked. But by chance, while Mukherjee visited his parents in New Delhi, he found out that Subbarao’s biographer lived only two blocks away. The biographer revealed he had a roster of all Farber’s patients. Piecing together those records with archives of deaths in Boston, Mukherjee found one child who had leukemia and died at three – Robert Sandler, who happened to have had an identical twin, Elliot. Sandler’s leukemia had spread enough to give him a fever, a limp, and eventually “indescribable pain”. Farber injected him with the antifolate, and Sandler immediately began to improve. The cancer didn’t vanish, but within a month, it had abated so that he resembled Elliot again. One week after his book published, Mukherjee recalled that he received a phone call from Elliot Sandler, who but Mukherjee in touch with the twins’ mother. She explained that her Jewish faith made her regard autopsies as sacrilege, but she allowed one to be performed on Robert. She said the decision had haunted her for decades but, after seeing Robert’s story in the book – which is also dedicated to Robert – “she felt she had done a service,” Mukherjee said. “I studied cancer for 12 years. I gave this drug about 30 times and yet amazingly, I did not know this spiraling story,” Mukherjee said. And as he noted in Q&A, “every child contributed to some piece of knowledge about how to treat this devastating disease.” Adults didn’t participate so readily in clinical trials, particularly, Mukherjee said, thanks to “a deep nihilism about cancer” in the 1980s. Mukherjee concluded by imagining the first known breast cancer patient – the Persian queen Atossa – receiving treatment through the ages. In 2500 BC, her ailment had a name, but no treatment. In her time, around 500 BC, she had her Greek slave perform a primitive lumpectomy. Two hundred years later, Hippocrates would call it karkinos; a few hundred years after that, black bile – thought to be trapped melancholia – would be a hypothesized cause. Medieval surgeons would try chisels, goat dung, crab paste, and holy water. In 1778, Atossa’s cancer would be assigned a “stage,” and in 1890, she would undergo a radical mastectomy. In the early 20th century, she would try radiation; in the 1950s, a localized mastectomy plus radiation. In the 1970s and 80s, she would try new therapies. And in the 1990s, genome sequencing would have targeted what mutation Atossa carried. She and her daughters would be screened and treated accordingly, with either minor lumpectomies or preventative prophylactic bilateral mastectomies. Read Mukherjee’s In The Green Room Q&A here.